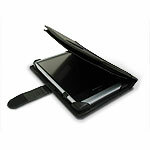 Perfect for carrying your LifeBook T Series Tablet PC while you go from meeting to meeting. 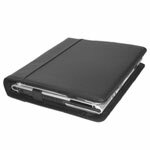 The portfolio is made of top-quality leather and its book style cover gives your highly sophisticated Tablet PC the classic look of a traditional paper bound organizer. 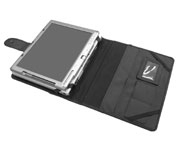 The Tablet PC is securely held in the portfolio with straps without blocking any portion of the screen or access to essential ports. Creatively designed to easily allow you to use your Tablet PC convertible in tablet and notebook mode. It can be used while standing in tablet mode and while sitting and typing in notebook mode. The interior features pockets to hold letter size documents and business cards.